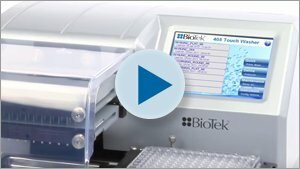 Automated workflows have gained in popularity with the increased adoption rate of cell based assays performed in higher density microplate formats. 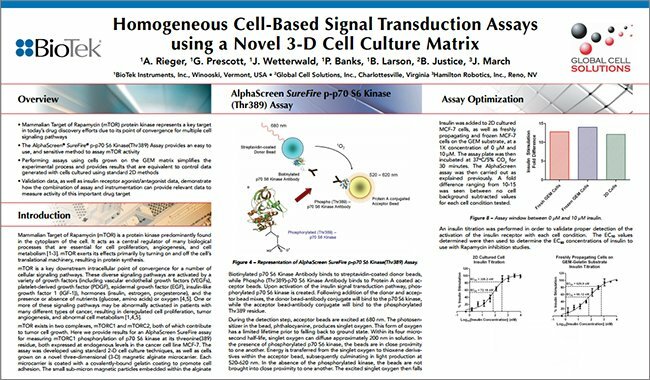 Increased throughput and reproducibility are best achieved when processes such as media exchanges and cell washing are automated in conjunction with reagent additions. 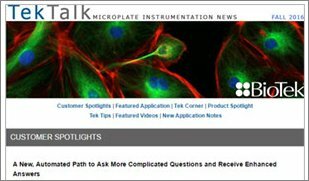 Microplate instrumentation has become more complex, as has assay development. 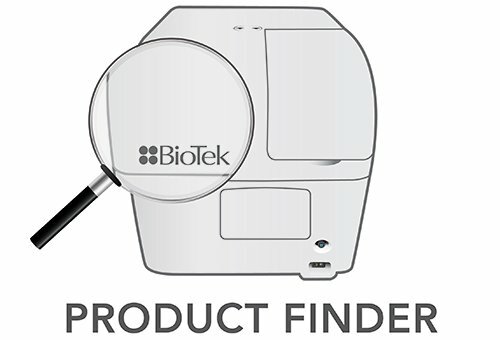 Liquid handlers now offer a wide variety of available fluid pathway combinations and detection instruments combine traditional detection channels with microscopy capabilities. 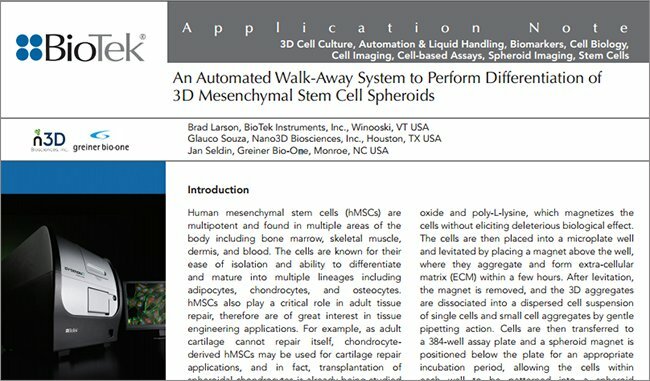 Automated workflows can be designed to offer walk-away solutions with increased performance when compared to manual methods. Many cell based assays rely on a combination of fluorescent reporter proteins and dyes spanning the light spectrum to achieve multiparametric analysis on a single microplate well (Figure 1). 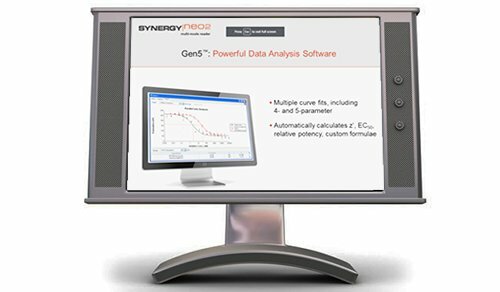 Primary to any cell based assay is both optimization of cell seeding density, and cell retention throughout the workflow. 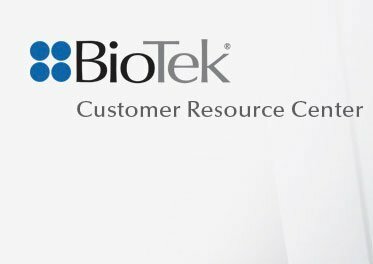 This becomes more significant as workflows become increasingly complex as exemplified by experimental procedures that require a number of liquid handling steps typically including one or more cell washing and reagent dispensing steps. 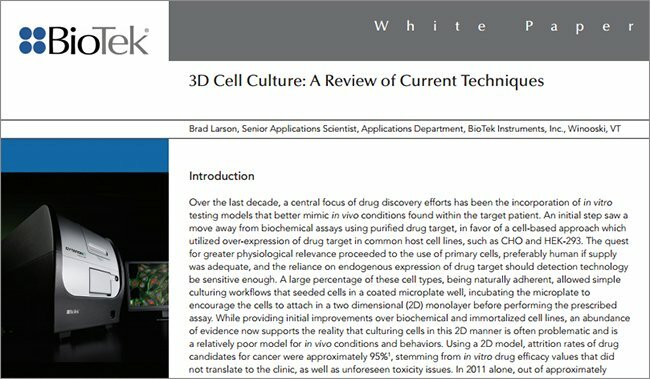 The importance of cell retention is compounded when analysis relies on data from several different time points during live cell assays. 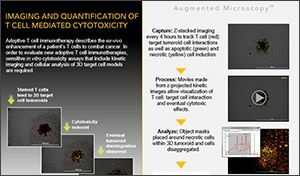 Here we describe the use of automated image capture as a method to quantify cellular retention in the microplate and to aid in optimization of automated liquid handling parameters and normalization of data during analysis. Figure 1. MCF7 cells constitutively expressing GFP (green) and stained for the nucleus (blue) at 4X magnification. All automated cell washes were carried out using the EL406 Combination Washer Dispenser. 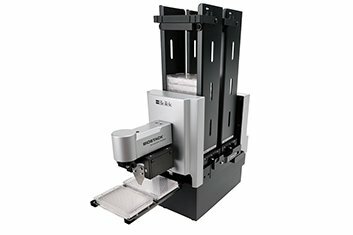 The EL406 provides full plate washing along with three reagent dispensers in one, compact instrument. Both peristaltic pump and syringe pump dispensers were used. 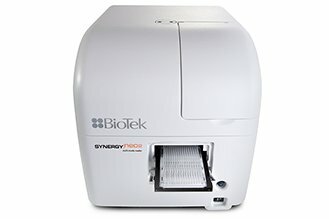 In order to maintain sterility, the EL406 Washer Dispenser was placed in a biosafety cabinet and 5 µL cassettes for the peristaltic pump were sterilized by autoclaving prior to use. MCF7, NIH3T3 and HeLa cells were cultured in Advanced DMEM supplemented with 10% fetal bovine serum and penicillin-streptomycin at 37°C in 5% CO2. Cultures were routinely trypsinized (0.05% Trypsin-EDTA) at 80% confluency. 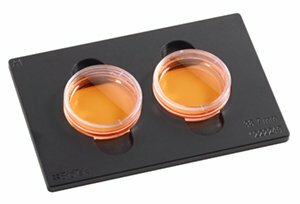 For experiments, cells were stained with Hoechst 33342 nuclear stain and plated into Corning P/N3904 black sided clear bottom 96-well microplates at 5,000 cells per well using the peripump dispenser of the EL406. Prepared plates were kept at room temperature and protected from light prior to imaging. Cell images captured with a Cytation 5 Cell Imaging Multi-Mode Reader (BioTek Instruments, Inc., Winooski, VT) configured with DAPI and GFP light cubes. The microscope uses a combination of LED light sources and band pass filters to provide the appropriate wavelength of light. 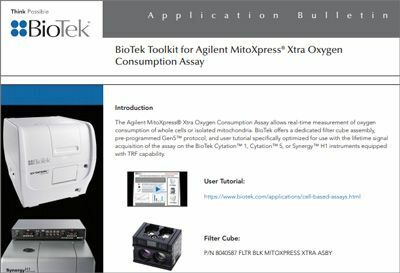 The DAPI light cube is configured with a 357/44 excitation filter and a 447/60 emission filter and the GFP light cube uses a 470/22 excitation filter and a 510/42 emission filter. Installed objectives included 4x and 10x magnifications. 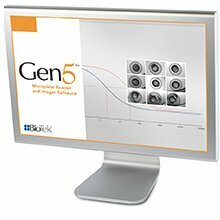 Image analysis and quantification was performed using Gen5 Software (BioTek Instruments, Inc., Winooski, VT). Images were captured using either the blue channel (for cell count) or both the blue and green channels (for comparison between cell count and cell confluency) prior to and following each cell wash step. 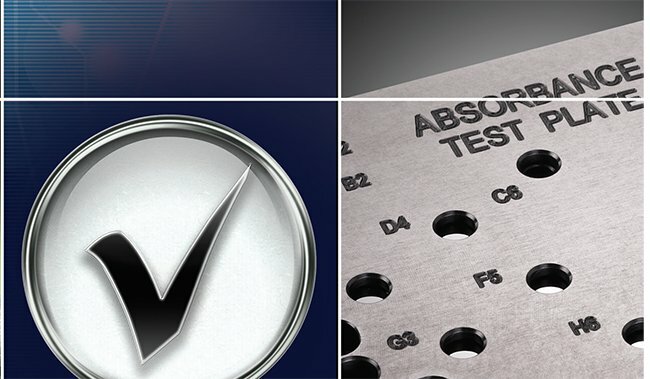 All collected images were preprocessed to flatten background prior to performing analytical methods. 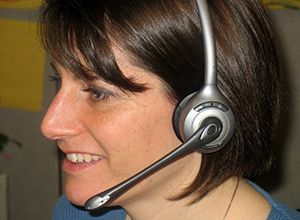 A cellular analysis was performed on the blue channel to provide a cell count based on the number of Hoechst stained nuclei. Image statistics were performed using the green channel to measure constitutively expressed cellular GFP for determination of cell confluency. Default parameters resulted in adequate computational data for further analysis. 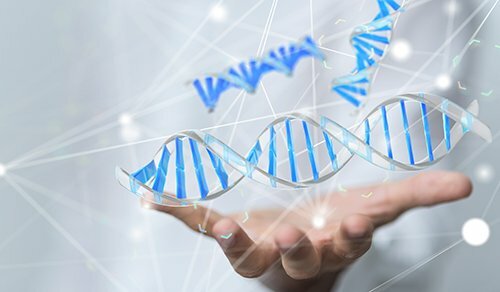 Reporter gene expression is commonly used for several purposes, including internal assay control for analysis of genetic regulatory elements or as a means to track cellular movement and proliferation. 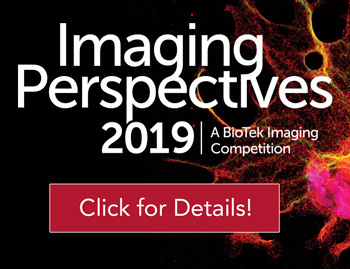 Automated image capture of several cell lines constitutively expressing GFP were used to evaluate the integrity of a cell monolayer for optimization of cell washing parameters for use with conventional workflows. 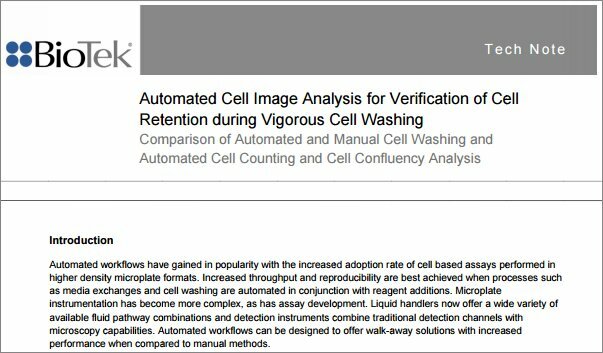 Twelve representative wells of a 96-well microplate were imaged both before and after several rounds of automated cell washing using optimized wash parameters (Figure 2). An estimate of cell retention in a microplate well can be determined by visualization of a single 4x magnification image within a well. 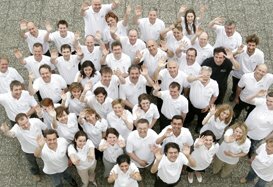 However, automated image analysis provides a fast, objective evaluation for validation of workflow processes. Analysis of GFP signal intensity (green channel) was used to determine cell confluency (Figure 2a and b). 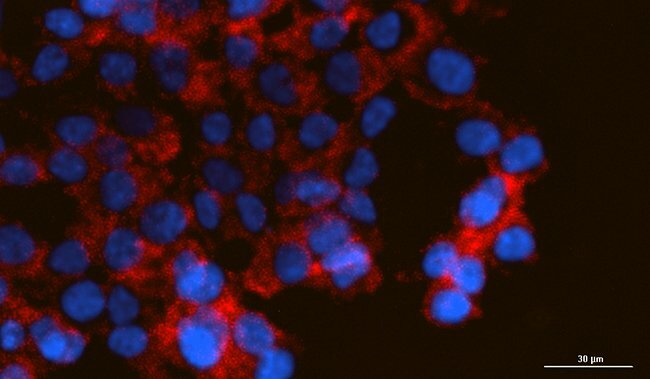 Additionally, the use of a cellular stain, such as the nuclear stain Hoechst 33342, can be used to monitor cell retention by automated cell counting (Figure 2c and d). Figure 2. 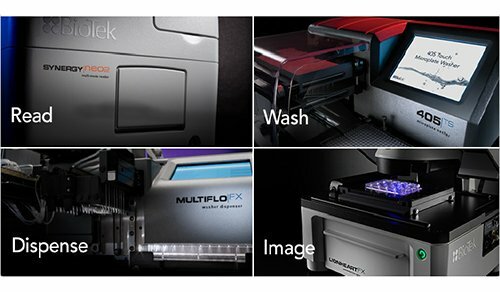 Cell confluency and cell count analysis both pre- and post-automated cell washing. MCF7 cells expressing GFP were seeded in a 96-well microplate for automated cell washing. The cells were imaged in 12 representative wells using a 4x objective before and after 3 cycles of automated cell washing. Images of GFP expressing MCF7 cells stained with Hoechst nuclear dye (a) confluency pre- washing, (b) confluency post-washing, (c) cell count pre-washing and (d) cell count post-washing. Automated image analysis by cell counting requires the use of an object mask for a given imaging channel. The Hoechst 33342 nuclear stain signal (blue channel) was used to identify individual cells for automated cell counting in the Gen5 software using default object masking parameters (Figure 3a). The percent cell retention was then calculated by dividing the cell count following each wash cycle by the initial cell count prior to cell washing multiplied by 100 (Figure 3b). It is obvious that cell retention is significantly higher when using automated methods as compared to manual washing using a handheld, multi-channel pipettor. Figure 3. 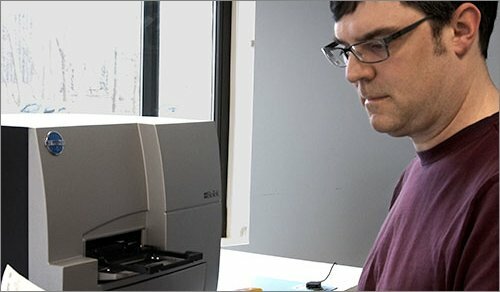 Cell count analysis. (A) Cell count is performed by object count of a primary mask meeting the defined criteria in Gen5 software. In this case the blue channel is used for nuclear identification shown outlined in yellow; (B) Percent cell retention is calculated by dividing the cell count following each wash cycle by the initial cell count prior to cell washing multiplied by 100. Cell confluency provides an optional method to determine cell density by identifying pixel intensity above a defined threshold representative of the object of interest (Figure 4a). Confluency is then calculated by dividing all pixels meeting the criteria by total image pixels multiplied by 100 (Figure 4b). Figure 4. 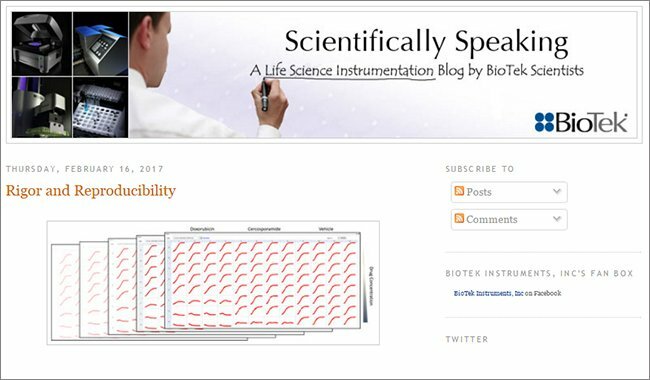 Cell confluency analysis. 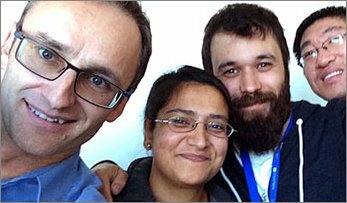 (A) Cell confluency is performed by identifying all pixels meeting the defined criteria in Gen5 software. In this case the green channel is used for: (A) identification of the cell density based on pixel signal intensity; (B) percent (%) cell confluency is calculated by determining pixels above the defined threshold, green channel, divided by total pixels in the image multiplied by 100. The entire well can also be imaged as a montage and stitched for determination of cell retention. 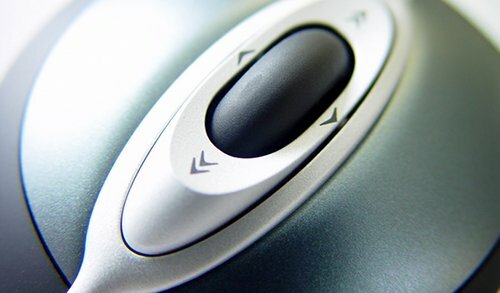 Default settings in the Gen5 software for montage imaging align images for minimal overlap. 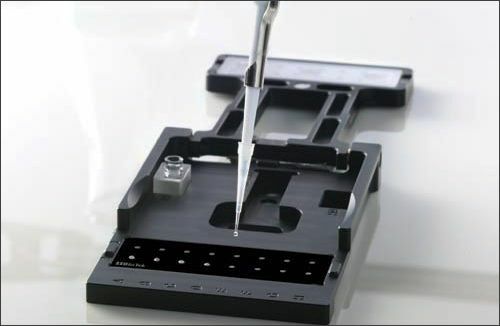 For cell seeding densities with minimal spacing between cells the resulting images should retain sufficient contrast to allow for effective stitching to be achieved with the added benefit of minimizing any redundancy in the images for accurate downstream analysis such as cell counting or assessment of confluency measurements. However, at lower cell seeding densities there is a need to capture montage images with sufficient overlap to allow stitching to be performed properly. Thus, it is recommended that a 10 percent overlap be included in both the horizontal and vertical spacing by decreasing the default values accordingly. A comparison of whole-well stitched montages using aligned images captured in the green channel, detecting constitutively expressed GFP in MCF7 cells, shows excellent cell retention following rigorous automated cell washing, fixation and staining (Figure 5). Note that image acquisition time and computational time will be significantly increased when whole well imaging and analysis is performed. Figure 5. Whole well imaging. A 5x4 montage of images was captured using a 4x objective and stitched using Gen5 to allow the entire well surface to be viewed for analysis. A close-up detailing a section of the stitched image is shown (right image). 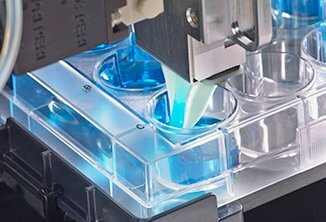 The use of automated processes to improve workflow can dramatically enhance cell retention, uniformity, and assay performance while reducing labor and mishaps. 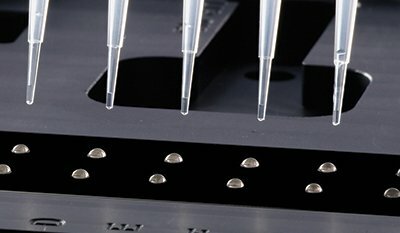 The use of microplates for cell based assays can further improve throughput and help reduce costs associated with reagent use. 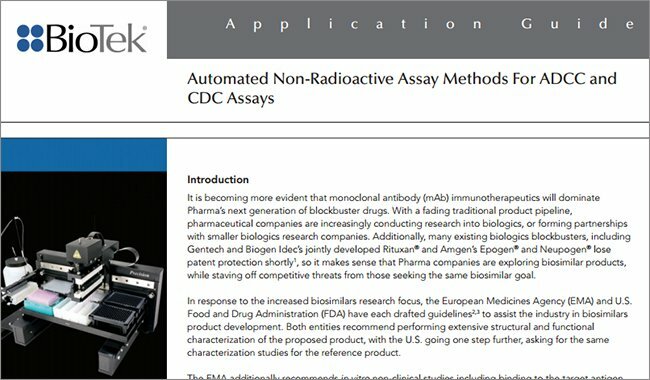 Optimization of automated processes such as routine media exchanges and reagent additions help improve assay repeatability. 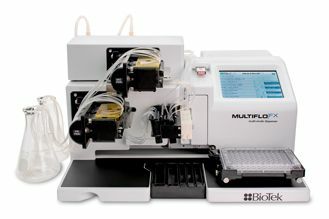 The ability to perform automated imaging of representative wells, a portion of a well or of the entire well both before and after automated processes can provide valuable information regarding the uniformity of the cell seeding density, the robustness of cell washing and validation of cellular retention.